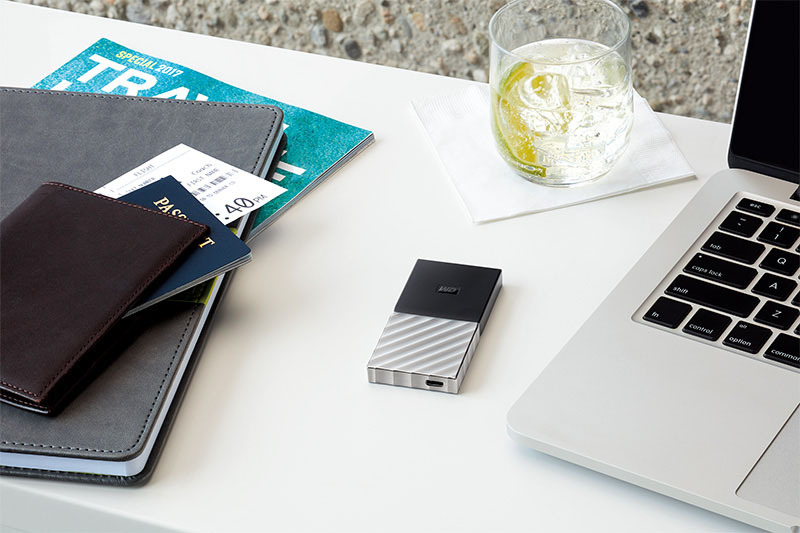 WD Launches First Portable SSD – The My Passport SSD! June 22, 2017 – Western Digital Corporation, (NASDAQ: WDC) today introduced its fastest WD brand portable drive yet, the My Passport SSD. Featuring blazing-fast speeds and award-winning design, the new My Passport SSD is designed for content creators and tech enthusiasts to manage massive files on the go. Featuring speeds of up to 515 MB/s, the My Passport SSD is the fastest My Passport drive offered by the WD brand. The new, super fast drive is designed for the latest generation of computers with a USB Type-C port and is USB 3.1 Gen 2 (10Gb/s) ready with a USB Type-C to Type-C cable and an adapter to use with the more traditional USB Type-A ports found on many computers. My Passport SSD is the perfect storage solution to rapidly manage large photo and video libraries, quickly back up files and important documents, run virtual machines from, or expand your SSD-laptop storage anywhere you take your computer. The new drive is available in 1 TB, 512 GB and 256 GB capacities, and comes with WD Backup software that enables users to automatically back up their stuff. The My Passport SSD is backed by a three-year limited warranty, and will be available at select retailers and distributors starting 07 July 2017. The My Passport SSD has a Manufacturer’s Suggested Retail Price (MSRP) of RM 2,099 (~US$ 499) for 1 TB, RM 1,039 (~US$ 249) for 512 GB and RM 579 (~US$ 139) for 256 GB, respectively. 1 TB (WDBK3E0010PSL-WESN) – RM 100 off! 512 TB (WDBK3E5120PSL-WESN) – RM 100 off! 256 TB (WDBK3E2560PSL-WESN) – RM 50 off!